From Pietramala to Lake Garda and the U.S.
Winterized Operating Room: shows changes made in the operating light to eliminate cumbersome legs and braces formerly used. 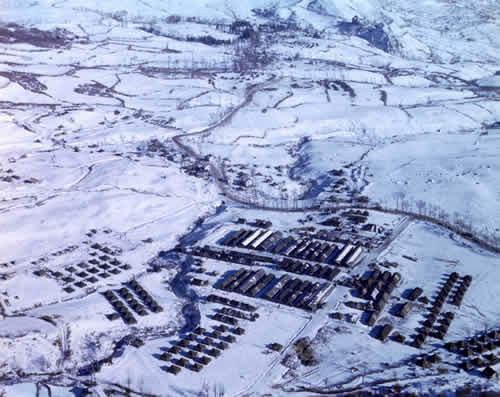 The 8th Evacuation Hospital was very busy in October and early November due to the Army’s attempt to advance in the mountains. During the winter months with less fighting the Hospital was only moderately busy, and the less hectic days permitted time for unit members to go to rest camps in Florence, Rome, or Montecatini. The coming of spring meant another offensive attack by the Fifth Army. In preparation the wards were cleared of those patients who could tolerate being moved further from the front. On April 15th the fighting started the area near the 8th Evacuation Hospital, and within hours the unit was deluged with casualties. At one point the Hospital had a backlog of eighty operative cases when it received another eighty-five wounded. The spring offensive was quickly successful. Within 19 days the Germans had been driven out of the mountains and across the Po Valley with all of their escape routes to the Alps blocked. More than a million Axis troops surrendered, and the war for Italy was finished. The 8th Evacuation Hospital was at Pietramala longer than any other location and treated over 9000 inpatients, of whom half were injured or wounded. Due to the stalemate in the mountains over the winter, the 8th Evacuation Hospital stayed nearer the front line for a longer period of time than any other evacuation hospital during the North African or Italian campaigns. By the end of April 1945 the Hospital was again on the move. It joined tanks, trucks, and pontoon bridges going north, while trucks loaded with German prisoners were going south.The convoy drove by piles of rubble, burned-out tanks, and destroyed trucks, carts, and ambulances to become the first Allied hospital north of the Po River. The end of the fighting in Italy meant that some 8th Evacuation Hospital personnel were sent home, some transferred to units scheduled to go to the Pacific, and others set up hospitals near Verona and Lake Garda. Colonel Kirkman, who had commanded the 8th Evacuation Hospital for ten months, was replaced by Lieutenant Colonel Drash. The 8th Evacuation Hospital functioned a little over four months at Lake Garda and cared for almost 5,000 inpatients. Of those only four percent were wounded; nearly three-fourths were diseased and the rest injured. The medical demands on the unit were less than usual, so there was time for swimming in the lake, sightseeing, and trips to army rest camps. By the middle of September most of the personnel were ordered to report to a replacement depot and within a month were on their way to the United States, where they were quickly demobilized after three and a half years of active duty. Dispensary: Soldier receiving an immunization shot. In its years of service the 8th Evacuation Hospital unit benefited from great changes in medical care and was involved in the first major war in which more Americans died of injuries and wounds than of disease. Preventive health measures for malaria were effective. Typhus and tetanus were nearly eliminated, and penicillin was a great aid in the treatment of wound infections and venereal disease. Plasma use on the battlefields saved lives, as did the blood bank in Naples. Psychiatric care improved with the advent of specialized hospitals. The Hospital functioned in the heat of North Africa and southern Italy and in the rain, snow, and cold of the mountains. At times the operating areas were all in use with 100 men waiting for surgery; at other times the staff had time on their hands and little to entertain themselves. Receiving more awards, commendations, and decorations than most similar units, it served longer in North Africa and Italy than any other American hospital. The men and women of the 8th Evacuation Hospital served their country well and were excellent representatives of the University of Virginia.